Summary of today’s show: Due to technical difficulties, today’s show notes will delayed until later Tuesday evening. However, the audio file is available for your listening and we hope you enjoy the show. 1st Segment: Scot welcomed everyone back to Saint John’s Seminary for today’s show, and asked Father Chris to describe the makeup of the faculty of the seminary. Father Chris said although he’s not very good with numbers al lthe time, they are up to 12 full-time faculty members, 10 of whom are “voting” faculty members. Fr Chris explained that voting means that the faculty vote each year on which men will continue in the seminary program the next year. He added there are three full time spiritual directors at the seminary – a Jesuit, a priest from the Brotherhood of Hope, and a diocesan priest to provide different guidance. Adjunct lecturers made up of lay men and women and priests round out a diverse faculty. Fr Chris said when he came on the faculty he was only seven years ordained – it was intimidating at first to be on the faculty with priests who had taught him in the seminary, like Fr Salocks, our guest today, who is in his 25th year serving on the seminary faculty. Fr Chris continued, saying that Fr Salocks is a wonderful preacher and scripture professor who works hard in the seminary to keep things on the right path. Fr Salocks also serves as the Academic Dean, Fr Chris explained, making sure that the men all have the correct number of credits to graduate from the seminary with the proper academic formation. Fr Chris and Scot discussed the difference between the internal form, created in spiritual direction, and external form, created through study. Fr Chris noted that the non-voting spiritual directors even leave the room when the voting faculty discuss the men’s progress, to avoid giving away any information at all that might have been given to them during spiritual direction. In that regard, Fr Chris said, the spiritual directors are almost under a confessional seal to keep their conversations with the men private. Fr Chris said his rule of thumb when voting is whether a man loves the Lord and his people, and whether he would feel comfortable sending his family to a potential priest to hear him priest or for guidance. Scot said that much of our formation as lay people comes from priests and pastors, especially when priests can relate the Gospel and readings every Sunday to our own daily lives. 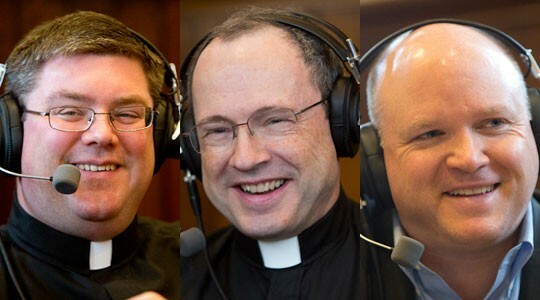 2nd Segment: Fr Stephen Salocks joined Scot and Fr Chris. Scot congratulated Fr Salocks on his 25 years on the seminary faculty. Fr Salocks said when he came onto the faculty in 1987 with Fr Paul Ritt, they both figured they’d be there about fifteen years. Fr Ritt was able to move on, Fr Salocks said, but he was not – firstly because it takes a lot to prepare people to teach scriptures, but secondly because learning the languages necessary is quite daunting. Fr Salocks said he loves working with the seminarians studying and teaching about the scriptures, that his long tenure on the faculty is nowhere near a penance as some may assume! Scot asked Fr Salocks what kind of studies he needed to do before even starting to study scripture in preparation to teach. Fr Salocks said that for the study of scripture, obviously Greek and Hebrew are mandatory – one cannot even begin the program at the Pontifical Biblical Institute until you have passed their language courses or passed a qualifying exam. Bishop Hughes gave Fr Salocks the option to either go to Catholic University or to stay at Harvard to prepare for the language studies – Fr Salocks chose to remain in Boston. He continued to study Greek and began his Hebrew studies, as well as two flavors of Aramaic (both Biblical and Targumic), theological German, and of course Latin and Italian. When he got over to Rome, Fr Salocks said he was very able to pass the qualifying exams in Greek and Hebrew, but he had to have even more Latin studies before he could start the program. Even once in the program, students needed to take another year of Hebrew and two additional years of Greek – highlighting how absolutely critical language is to the study of scripture. Scot commented that it’s like a double major – not only Scripture, but languages as well. Scot asked what of those languages Jesus may have spoken – Fr Salocks answered that a local dialect of Aramaic would have been the common language, but that he would have certainly had knowledge of Hebrew in order to pray. Scot asked Fr Salocks to explain where he grew up and how he originally heard the call to be a priest. Fr Salocks started by saying that he was born in upstate New York in Troy, near Albany. His parents moved to Northern New Jersey, where he went to Catholic school with the Sisters of Saint Joseph in his parish school. The Franciscans ran his parish, and it was there that the seed was planted – every young man, Fr Stephen said, was a potential priest to the priests and nuns there. Several of his friends went on to the Franciscan minor seminary. He said he mentioned this to his parents, but they were both insistent that he should go on to high school and college to find out about what life was before he made the decision to be a priest. He continued to a public high school and Rensselear Polytechnic Institute and studied biology and chemistry. In 1972, Fr Salocks continued, the conflict in Vietnam was still going on, and he got drafted – the one lottery he’s won in his life. He figured the best way to proceed was to enlist for an extra year, which allowed him to choose a medical laboratory as his first station, working as a clinical chemist at Walter Reed Medical Center. A placard outside the Medical Center chapel from the Holy Cross Fathers had an information card that he filled out and sent in. Within a year, Fr Salocks said, he had applied enough of his skills to practical projects to get a transfer to Natick Laboratories here in Massachusetts doing food research studying tomatoes. Fr Salocks said he still gives the lab a blessing every time he drives by. St Patrick parish in Natick was an important part of his call, Fr Salocks continued. By the last 6 to 8 months he was at the lab he was attending Mass almost every day. There was a young priest who was newly ordained in 1974, Fr Jack Sullivan, who would speak from time to time about the seminary. Later, Msgr. Mahoney and Fr Sullivan wrote letters of recommendation – Fr Salocks’ last two weeks of Army and first two weeks of seminary in 1975 overlapped. Fr Salocks noted that he’s only ever been away from the seminary for five years since 1975 – two years in the parish and three years to study! Scot commented that now, many military men seem to be experiencing calls to the priesthood. Fr Salocks said that for the most part, most Army people were just focused on getting out during the draft and tumultuous times in the 1970s. But still, a chaplain at Walter Reed gave Fr Stephen his first real Bible and some catechetical lessons – there just weren’t a lot of people who wanted to enter the seminary from the Army. Scot asked if scripture was one of his favorite courses while he was at the seminary – Fr Stephen said that, early on, it scared the daylights out of him! His first course was in the Old Testmament, Fr Salocks explained, and he took philosophy and theology courses spread out over a few years. The word “exegesis” just sounded so outlandish to him, and he even struggled with the method as a scientist. The end of the second year, a history teacher suggested he take Greek because he had some spare time. After a year of Greek, things made sense – he found a gift with language. After his success with Greek, he went back to the scripture and truly dove in – it began to click then, Fr Salocks said. He started to see how he could put scripture into Catechetics and education. Fr Chris asked Fr Salocks to explain what the phrase “Scriptural exegesis” means. Fr Salocks said that it is a “reading out” of the passage of scripture, and trying to understand the passage as the author intended it – what was the original author saying to his readers in the original passage? This is opposed to taking our own reading and bringing it in – eisegeses. Scot asked where Fr Salocks’ first assignment was – Fr Stephen replied that he was at St Michael parish in Hudson – with four priests, thirteen sisters in the convent, a thriving Portugese population – like stepping back in time. He was there for two years before he was called by Bishop Hughes to go to Rome to study. Fr Salocks said it was difficult to leave parish ministry – he enjoyed the wonderful people in Hudson with the two schools and religious education program, a cemetery, even a CYO band. Fr Salocks explained that he figured he could accomplish the scripture degree, so he left July 1st 1982 and moved in at the seminary to take language courses, and then went to the Pontifical Biblical Institute for his Licentiate in Sacred Scripture. Scot asked if most of the people in his classes were following a similar path – Fr Salocks said many were, but it was interesting to meet with language groups among priests, a few women religious, and a lay man – all looking forward to teaching in some regard. After earning his degree in 1987, Fr Salocks took his comprehensives and came back to St John Seminary. 3rd Segment: Every priest needs to open the Scriptures regularly to read and preach about them, Scot said, but it must be a different level to go back to the original texts for intense exegeses. Fr Salocks agreed, and said that moving from being a priest who would preach and teach in the parish to in depth studies is a jump. The languages are a big thing – Fr Salocks said that in Rome, he was never permitted an English Bible, only the language in which the original book was written. Scholars must be as familiar with the crucial language of the original text itself, he explained. When other compatriots in Rome were sometimes taking their evening walks, he was translating everything that he studied in his room. As he was going through the Scriptures he was getting ready in one sense for the large exams, he was also readying himself to teach. At the same time, moving back from a straight lecture style in Rome to an interactive one in Brighton was a challenge – his teaching method has developed over the last 25 years with feedback from students. The difficulty for seminarians taking an introductory course in Scripture is the amount of material that needs to be covered is immense. Fr Salocks said the first course he teaches is an introduction to the Synoptic Gospels and the New Testament. The senses of Inspiration, the unity of the two Testaments, the history of the Church are important – dealing with Biblical history from Alexander the Great to the Second Jewish War, New Testament Christology, Exegetical Methodology, and then having time to focus on Matthew, Mark, and Luke too! Fr Salocks said he has ways of getting the points all across in one semester with charts all over the walls, just like the big high school poster papers. He said some priests will occasionally say that priests tell him they still pull out the charts when they do a Bible study. Fr Chris asked Fr Stephen who his favorite Gospel writer is. Fr Stephen answered that his favorite is St John, the fourth Gospel – a very rich Gospel, plus it’s a bit of a luxury to have a full course to teach about that Gospel! Scot asked Fr Salocks to explain what the difference between the Synoptic Gospels and the Gospel of John are. Fr Salocks began by saying that he always says the biggest problem with studying the Synoptic Gospels is that they have already read John’s Gospel. In the 21st century we have a defined portrayal of Jesus, a Christology – in the 1st century coming out of the life, teaching, suffering death and resurrection of Jesus, the Apostles go out and proclaim. Towards the end of the 1st century, the original eyewitnesses start to die out – Jerusalem is destroyed by the Romans, there is a breach between Christianity and Judaism; all this created a need for a concrete way to preserve the Tradition. Fr Salocks noted that are always called a people of Scripture and Tradition because of this. From this desire to record the tradition, a disciple of St Peter in Rome writes down everything he knows and has heard about Jesus – this is the first Gospel, Mark, written from Rome to try to help Christians in Rome understand who Jesus is. This isn’t a bed of roses either – it’s suffering, serving, being a disciple. Within the next ten or fifteen years, that Gospel and other sources of Tradition are present perhaps in Antioch where Matthew likely wrote his Gospel. Matthew is addressing a different situation than Mark – how do we understand Jesus as God with us? The end of Matthew, Chapter 28, encapsulates the entire theme of the Gospel – “I am with you to the end of the age.” But Jesus now is emphasized as the authoritative interpreter of the Scripture – this is a reaction to the dialogue between the Christian and Jewish faiths about who the authentic interpreter of the Tradition is. Roughly the same time, in a place that is a bit more fuzzy, Fr Salocks continued, Luke is writing a Gospel. But right from the start, Luke emphasizes that he is not an eyewitness but rather is drawing on the experiences of others (Luke 1-4). He also has a copy of Mark’s Gospel and some resources from Matthew. Luke’s focus is Jesus as the Savior, and how Salvation becomes known through the peace and forgiveness that Jesus brings. Luke believes that the message to “take up the Cross daily and follow” Jesus is so important that he writes a second volume – what we know as the Acts of the Apostles, Fr Salocks concluded. It’s fascinating to see how well all three Gospels tie together, Fr Salocks noted – even the spelling is coherent in many ways, not just the phrasing and wording. They are truly of the “same eye” – “Synoptic.” It wasn’t until the 18th century that someone drawing up columns to study the Scripture put all three Gospels side by side and saw the incredible similarities between the three. John, of course, is the non-Synoptic Gospel, called by one scholar the “maverick.” John is the spiritual Gospel, one that delves more deeply – miracles are fewer, and not even called that – they’re “signs,” emphasizing John’s focus on Revelation throughout his Gospel. Fr Salocks said he likes that idea, as he feels that Scripture itself is incarnational, the Word of God and the human words about the Word. Scot emphasized that most people think “synoptic” is more related to “synopsis” – to think that all three Gospels were written from the “same eye” is a great way to explain the similarities and emphasize the reality of Inspiration. Scot asked Fr Salocks to explain a bit more about the Inspiration in the Catechism. Fr Salocks explained that the phrase “Word of God” in Greek or Hebrew – the whole sense of “word” is more than a verbal sense, it is the reality of God, the experience of God. When a prophet said “the Word of God came to me thus,” they were saying that the reality of God had touched them. We can imagine, Fr Salocks continued, a prophet being overwhelmed, or the people of Israel escaping slavery, and the reality of God overwhelms them as much as the Red Sea overwhelmed chariots. Inspiration is a heavy theology course in and of itself, Fr Salocks commented, but the Scriptures are the object of God’s Inspiration and not a “divine download” from God to the evangelist or to a prophet, where the bars go to 100% the Gospel is complete! No, it is rather a process whereby a people together with a gifted individual in their midst collaborate to record how God has revealed Himself to them, and how do we understand that. As soon as a person or a people being to think about and talk about their experience of God, they are interpreting it, Fr Salocks said – we look at the Scripture and we understand that this is a record of our ancestors in the faith interpreting their experience of God, putting it into words in their time. Because it is the Word of God, we approach it with faith in the context of the Church. Because it is human words about the Word of God Fr Salocks continued, we approach it with certain methodologies that help us discern the meaning of the words. Academic criticism of the Scripture is not a disrespectful approach to the Word, Fr Salocks emphasized – it is rather a discernment of meaning. Fr Salocks suggested reading lines 101 to 141 in the Catechism that explain much of this literal sense and Spiritual sense of Scripture. There is an allegorical sense to Scripture – how does each passage help us understand Jesus or help us to know how to act? Fr Chris asked Fr Salocks what he teaches priests about preaching, and what tips he might offer to communicate and break open God’s word for those sitting in the pew. Fr Salocks said that any preparation to preach should always start with basic exegetical work to understand the passage – but no homily could ever just be an exegetical paper! Too many syllables can lose people right away. Like the Gospel writers, priests need to be aware of the congregation – their “audience.” The US Bishops teaching on the homily and Sunday liturgy features the congregation as Chapter 1, Fr Stephen said. Knowing what kind of issues the people are facing can help craft the homily. Finally, Fr Stephen said, he always encourages people to read – books, newspapers, magazines, letters. We must be familiar with our own language to be able to accurately communicate the Biblical language. Scot closed the show by asking Fr Salocks what his favorite passages of Scriptures are. Fr Salocks said there are many – among the top would be the end of Matthew’s Gospel known as the “Great Commissioning,” and John Chapter 17 when Jesus is in the Garden praying to His Father.